2 bedrooms both with ensuite. Very well appointed throughout to a high standard. The apartment is situated on a quiet road just below the centre of 1650, a 50metre walk takes you to the escalator which takes you to the village and the ski slopes consequently it is very quiet but extremely convenient for the village centre, shops bars and ski lifts. The apartment itself is on the first floor of a chalet with 3 other apartments and has just been fully refurbished to a very high standard. The apartment has a wrap round balcony with the main aspect facing due south, looking upto 1850 and also west down the valley. It is a wonderful suntrap with beautiful views. There is parking but on a first come first served basis. Underground parking is available in the village. We live in Bretton nr Wakefield, West Yorkshire and have been retired for nearly 10 years. We love the Alps and ski for about 6 weeks of the winter. Our contact nos are 00441924830366 or mob 00447711603644. It is quiet but very convenient for the village centre and the ski slopes. It also has faces due south, is a great sun trap and has tremendous views upto 1850 and down the valley towards 1550. It is also close to Aquamotion, the new water/ swimming centre. Both bedrooms have en-suites, with toilet, sinks and large showers. Very comfortable lounge with two large sofa's, free view TV, radio and CD player. Open plan dining off the kitchen and a feature fireplace. The living space has large picture windows which get the sun most of the day. It is a new large open plan kitchen, with built in dishwasher, washing machine, fridge freezer, oven, induction hob, microwave, double sink coffee machine, kettle, granite work tops and a full range of pots, pans and crockery. Wrap round balcony which faces due south. It looks right up to 1850 and due west down the valley. Great for sitting out after skiing especially in later season. The apartment is very close to the village centre, ski lifts, bars and restaurants. The new aquatic centre is 2 escalator rides and a short walk away. Cleaning / Towels / Linen / Maid service: All bed linen and towels are provided on a weekly basis. The apartment will be clean on your arrival and you are expected to leave it in the same condition. A maid service can be provided at an extra cost. Other: Entrance hall with coat racks. A well appointed, clean and comfortable property that made us feel at home from the very start. The property is well appointed and very comfortable making us feel at home from the very start of our holiday. Super clean, warm and welcoming we had a great week and didn’t miss the luxuries of a 5 star hotel, we actually enjoyed it more! Situated just a few paces away from the excellent escalator in Moriond this was a godsend as we have a 5 and 7 year old who tend to avoid walking where possible. We love Courchevel and we loved this property. We will be back. Staying in Chalet Bellevue made our Christmas holiday extremely enjoyable. We found the chalet to be exceptionally clean, well equipped and very comfortable. The chalet has been finished to an exceptional standard. We will certainly be returning in 2018. This apartment is well placed, being so close to the escalators. You can go up to the village and to ski or down to go to the amazing leisure pool. Even a day in the apartment is fabulous because the views from the living room are incredible. The beds are comfortable, the living area inviting, the temperature is warm and the kitchen very well equipped. It is definitely a five star apartment. We stayed here in February 2016. The apartment is just lovely. It has amazing views, is located very close to the village escalator and is decorated and furnished perfectly. There is everything you could want in the kitchen and even lovely touches like bird food to refill the feeder on the balcony. The only negative was the lack of wifi which my teenage children moaned about incessantly. We had a great stay over xmas in this apartment. Communication in the build up to our holiday with the owner was excellent. When we arrived we were so happy with the apartment - clean, tidy, lovely interior and in an excellent location. Would love to stay here again! 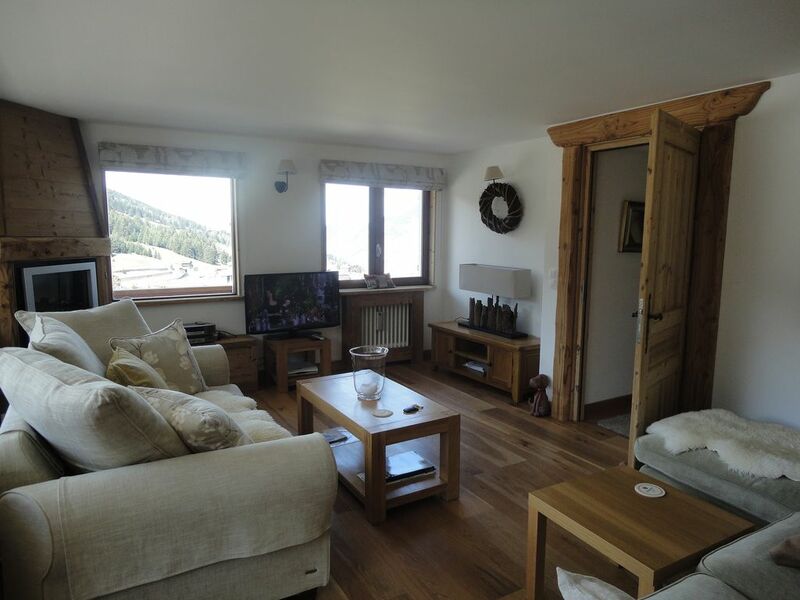 This beautiful chalet is 5 star standard throughout. The kitchen was well equipped, sofas were very comfortable, the beds and bedding guaranteed the best sleep for everyone. Bags and bags of storage. Spectacular views from nearly every window and night times very peaceful. Thirty steps to the escalators and you are in the centre of the village (and right next to the boulangerie). I can't imagine why we would ever look anywhere else - this chalet is perfection. Courchevel 1650 is approx 30 mins from Moutiers, 1 hour from Chambery and 2 hours from both Lyon and Geneva. Personal Private transfers can be arranged for you. Price on application. Booking Notes: Our preferred change over days are Sundays, but we can be flexible. Arrivals after 4pm. departures before 11 am. At the latest. 30% deposit with balance 6 weeks prior to your departure, plus a security deposit of £ 250 which will be refunded two weeks after your visit. We can occasionally be flexible on minimum days of stay Changeover Day: Sunday to Sunday, can be flexible subject to availability.